Best Shrouded Spoils Video - We want to see your best video clips from Shrouded Spoils! With the treacherous fog rolling into the Sea of Thieves, we’d love to see familiar islands in a new light or unexpected encounters in the fog. We’re also keen to see crews taking on newly populated Skeleton Forts or previously unseen Megalodons for their rich rewards. Best Shrouded Spoils Fan Creation - Has Shrouded Spoils inspired you to get creative? Perhaps the array of Megalodon patterning has made you feel like breaking out the paints, or you’d like to recreate some of the new spoils such as the Mermaid Statue Gems or super new Stronghold Gunpowder Barrel? Don’t keep your talents hidden under a shroud! Tweet your submission to us on Twitter using the hashtag #ShroudedSpoilsCC in your tweet. Upload your submission to Instagram using the hashtag #ShroudedSpoilsCC in your post. Enter on Facebook by leaving your submission on our wall with the hashtag #ShroudedSpoilsCC. Submit your content here on the Forums. If you're submitting video content to us, it must be hosted on YouTube. There will be two Grand Prize winners selected, with one from the Fan Creation Video, One from the Shrouded Spoils video. 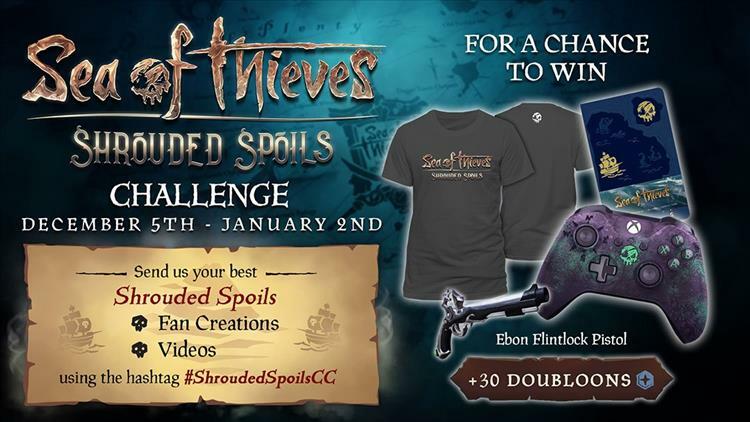 Each winner will receive a Sea of Thieves Limited Edition Controller, Shrouded Spoils T-shirt, 30 Bilge Rat Doubloons and the Ebon Flintlock Pistol. In addition, there will be three runner-ups selected from all the video submissions, with each receiving a Shrouded Spoils T-shirt, Sea of Thieves Journal, 15 Bilge Rat Doubloons and the Ebon Flintlock Pistol. The winners will be contacted on 01/09/19 and announced on Rare's social media accounts and website on 01/16/19. Good luck to all that enter!